When I first found out I was gluten and dairy intolerant, the prepackaged food options were scarce at best. That was 2009, and things have dramatically changed since then. The best books on Celiac and Gluten Sensitivity that I could find included Living Gluten Free for Dummies and ROCK (Raising our Celiac Kids); both are great resources, but didn’t really hit home for what I was looking for – a book on how an adult transitions to a gluten and dairy free life. Today, there are tons of amazing products that are certified allergy-free, including dairy and gluten free, and I’ve made it my mission to test them all to help you weed through the good (and not so good) products, so you can shop with confidence that you won’t waste money on products you or your family are less likely to love. Sometimes the products are donated to us, but often times we buy them ourselves, and share our raw and honest opinions of them with you. Today, I have a ton of food wrappers on my desk, just waiting for me to toss them in the recycling bin, but I can’t do that until I get a review of each of them live. 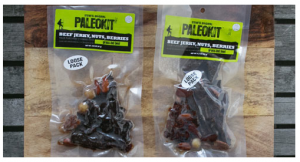 So, to help get my desk cleared, I’m drafting several reviews now, starting with Steve’s Paleo Kits. If you’re involved in Crossfit, or familiar with the Paleo movement, you have probably heard of Steve’s Kits. I’ve heard from some friends that these are the best tasting, and freshest jerkys they’ve ever had, and since these guys are pretty particular about food, I figured I’d give Steve’s a shot. We picked up the LOOSE PACK PALEOKIT (GRASS FED) and the BERKY, beef jerky made just for kids which combines jerky and berries (clever play on the name Berky, right?). While our products contain no gluten, dairy or soy, they are not made in a certified/dedicated gluten-free facility. If you want more information on the ingredients we use, you can find them on our site under each product’s individual listing. I have to admit that my first impression when I saw the PaleoKit was that it’s small for the price point. At $9.90 for 2 kits, they’re a bit on the pricey side, but again since I have heard how delicious they are, I went ahead and bought them. Here’s what Steve’s has to say about their LOOSE PACK PALEOKIT… A delicious mix of grass-fed jerky, raw macadamias, almonds, pecans and dried fruits, PaleoKits are perfect for people on the go. Vacuum packed (loosely sealed) for maximum freshness, PaleoKits have a six-month shelf life and are great on-the-go fuel for life’s journey. PaleoKits are available in a small size for snacking and large size for meal replacement. Following Zone®? A small contains two blocks of protein, carbs and fat and a large contains 4 blocks of each. To view nutrition information, please click here (PDF). 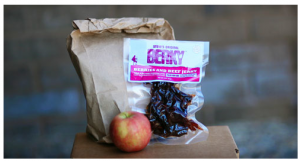 Our next sample was Steve’s Berky; a beef jerky packet made of berries and beef jerky, Berky is gluten-free, nitrate-free, nut-free, and MSG-free. It’s also full of deliciousness according to our son 🙂 After giving him a sample, I took a bite myself, and have to agree; Steve’s did a fabulous job of making a Paleo jerky kit that kids will love. Again, this version was more tender and moist than jerkys of the past, so our best guess is that’s a trait that you will find consistently across their products. The team at Steve’s are friendly and quick to respond to your emails in the event you have any questions, and while they were happy to answer my questions, they did say that since they donate a portion of their proceeds to charity, they don’t offer any free samples. No worries, we bought them at a local store here in town and tried them out, though you can also purchase them here online. Another point worth mentioning is that Steve’s donates a portion of all sales from Steve’s PaleoKits to help fund Steve’s Club, an organization they founded to help keep kids healthy, active and focused on living good lives. Steve’s Club is now a national program, helping kids around the country discover that a strong body equals a stronger mind, and that every choice made today effects potential for tomorrow. To find out more about Steve’s Club, visit stevesclub.org and feel good about the fact that you’re not only feeding your family a healthy meal, but you’re helping keep kids off the streets, and focused on better health and helping them carve a better life for themselves. Good food, good cause! Overall rating? A Thumbs UP for sure! These kits are convenient, delicious and super handy to have in a crunch. The biggest drawback? I found myself wanting them pretty often and we breezed through the few packs we bought pretty quickly. I guess that’s a good problem for Steve’s to have, though I started thinking about buying a humidifier and making my own jerky when I figured out how much I would be spending on these PaleoKits monthly. Then I remembered how little I like to prepare meats and how even less likely I am to actually follow through on the hydration process and headed back over to their site to purchase some more. Oh well – good intentions! « Van’s All Natural Foods giveaway!